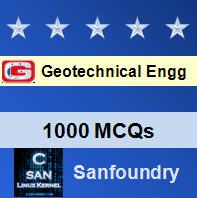 This set of Geotechnical Engineering Multiple Choice Questions & Answers (MCQs) focuses on “Settlement of footings”. 1. The total settlement of a footing in clay is considered to be consisting of___________components. S = Si + Sc + Ss. 2. The component Sc, used in the total settlement of clay refers to which of the following? Ss = settlement due to secondary consolidation of clay. Si =q B (1-μ2/E s) I w.
Explanation: As suggested by BIS Code IS: 8009 Part 1, 1976 the value of influence factor Iw for rigid footing is 0.82. Si = μ0μ1 q B (1-μ2/Es). Es = (σ1-σ3)/ΔL / L.
Explanation: The combined footing may be rectangular in shape if both the columns carry equal loads, or may be trapezoidal if they carry unequal loads. = 1.70 for rigid rectangular footing, with L / B =5.